Here are more details on what to expect about backcountry camping, menus and cooking, activity levels, and our wilderness travel style on the Patagonia Packraft Expedition. Every trip has an extensive safety plan. Even though our guides are rescue and safety instructors on industry-leading international certification courses, we still train together specifically for the Rio Puelo with practice scenarios. In all of our training we focus on prevention and good decision making, and we practice what we preach. The maximum guest to guide ratio on the Patagonia Packraft Expedition is 5:1. Argentina and Chile are some of the most stable and secure countries you can visit in South America. We recommend that you visit your family doctor or a travel clinic while planning your trip. Contact us if you have any questions at all about safety. It’s one of our specialties and we enjoy talking about it. As lifelong wilderness travelers our guides certainly feel more safe on a river trip than they do in the city. Our primary goal is for you to feel the same way! Great food’s a highlight of every trip. You need to be properly fuelled to stay safe—and have energy on the water and trails. And a fun part of travel is exploring local cuisine. 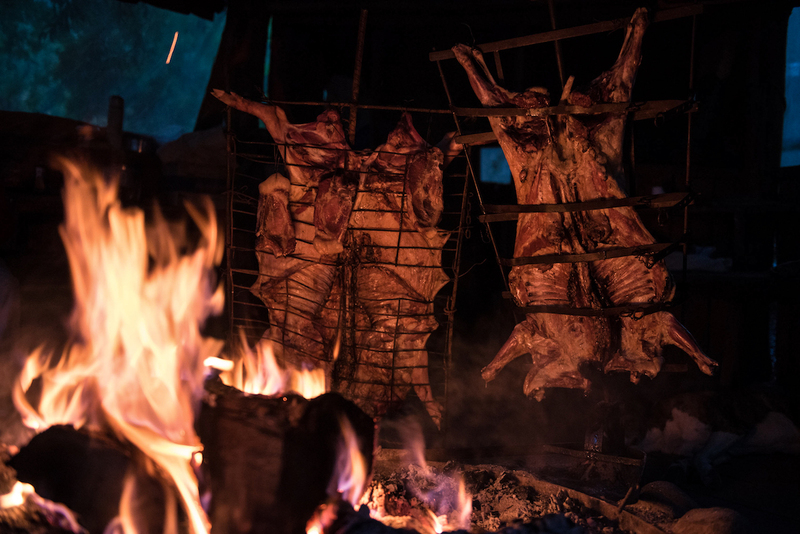 On this trip, you’ll enjoy the region’s full range of specialties: from amazing restaurants and chocolate shops in Bariloche, to a traditional lamb ‘asado’, prepared by your local hosts. And there’s no shortage of ways to wash it down—whether you prefer Malbec, espresso, or yerba mate. Your guides and local staff will show off their cooking skills with high quality food and plenty of it. For the days when we’ll be self-supported packrafting, we’ll split up the food so everybody carries some. You’ll learn about lightweight food systems, which are based around high quality meals and good planning. Luckily, along the way, our local paisano hosts on whose land we’ll be camping some nights will whip up some delicious meals—to fill us up and save us pack weight. The team is not only you and other guests, but our expedition partners at Paddle Patagonia. You’re itinerary includes 4 nights expedition camping in hammocks on the riverside, 1 night (night two) at La Confluencia Lodge, and 2 hotel nights in Bariloche (first and last). The one item you may not have is a lightweight 3-season sleeping bag, so we give you the option to rent one from us. Arguably the most important part of a successful trip is sleeping. A cool thing you’ll get to try on this trip is sleeping in a Hennessey Hammock. If you’re thinking: “sleep in a hammock?…no thanks”, you should check these out. Even people with bad backs and side sleepers find them very comfortable. They are the perfect pieces of gear for a packraft expedition: lightweight, comfortable, rain storm proof, and easy to set up. They’re off the ground so even if the ground is wet, you’ll be comfortable. There’s no need to buy bottled water in Patagonia. The lodge and hotels all have clean drinking water. On the expedition when camping on the riverside, we’ll explain a couple of options for pooping comfortably in the mountains. The Patagonia Packraft Expedition is 4 out of 5 on our activity level scale.